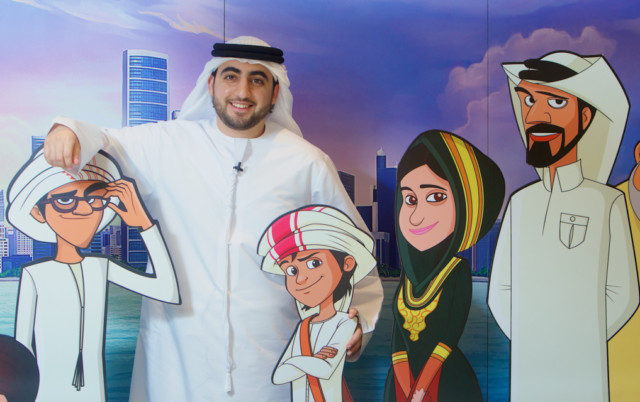 Abu Dhabi: Fans of the popular Emirati cartoon series Mansour, will be glad to know it is returning for a second season next year with plenty of plot developments and even a new character. In a press conference held on Wednesday, Rashid Al Harmoodi, creator and executive producer of the cartoon, said the team has created a new Saudi character named Turkey and developed one of the current characters, Shamma, to give her a more prominent role. The developments are part of efforts to reach a wider audience including children in Saudi Arabia and young girls. The new season is expected to appear on Cartoon Network Arabia in the summer of 2015 with 26 11-minute episodes. Adam Khwaja, creative director at Cartoon Network Studios Arabia, told tabloid! the new season will feature the characters travelling more widely in the region in their adventures. He added that there were some enhancements made to one of the sidekicks, but declined to elaborate. “We remain open-minded about expanding the series beyond the region. It might go beyond [the Middle East and North Africa]. We know some of our largest markets in terms of international audiences are Saudi Arabia and Egypt, but North Africa is also huge, and we’ve seen downloads across Mena,” Khwaja said. Discussing the writing process, the creator, Al Harmoodi, said it was the hardest part, and that the script is first written in English and then Arabic, as the writer is an English-speaker. “We have a lack of Arabic-language writers in the region. The difference between good content and bad content is the writing, so we try to make sure our writing is great,” the creator said. The show blends comedy with multinational characters and storylines that deliver positive messages to children about their culture, values and the importance of having a healthy lifestyle. It also encourages children to pursue careers in knowledge-intensive industries, and reinforce their cultural identity. The second season builds on the fan base already generated from the cartoon series and the Mansour Run mobile application, which has received 1.2 million downloads globally since its launch earlier this year.